2015 Wind Gap, by Pax Mahle, Syrah, Sonoma Coast. The Wind Gap Sonoma Coast, is sourced from top sites, and in 2015 proprietor Pax Mahle (of Wind Gap and Pax Wines) did not bottle his Armaugh, Majik or Walker-Vine Hill vineyard designates, because of tiny yields in this drought vintage. The little fruit he was able to harvest off those sites ended up going into this, the appellation-level Syrah, under his Wind Gap label. Those conditions and Pax’s talent in the cellar all led to a purple/opaque, pefumed and full-bodied effort with classic Pax character, making for a much more serious version of this wine, which is not usually this deep or dense, it’s a sleeper wine that will be coveted by the Pax faithful and Syrah fans. Pax himself adds, the palate shows the fruit of Nellessen immediately with subtle black pepper and silky concentrated fruit. It isn’t until later that you get the firm black fruit tannin and intense iron and game from the Armagh Vineyard and the smoky incense sexuality of the Majik Vineyard. With Wind Gap now fading away, with most wines now being put under the main Pax label, there are lots of retail outlets giving huge discounts, and I got this for the cost of an average Cotes du Rhone! Making it an even better value than its already reasonable release price, I suggest people search out these deals too! The other thing I’ll mention, if this is the entry level wine, be sure to get on to Pax’s upper level offerings, especially the upcoming 2015 Syrahs, like his Griffin’s Lair! The fruit is outspoken here on this 2015 with ripe opulence and deep flavors, explosive on the palate with sweet plum, boysenberry, blueberry compote and juicy black cherry fruits along with loads of mouth filling texture, wild flowers, faint peppery notes and lingering creme de cassis and baking spices. 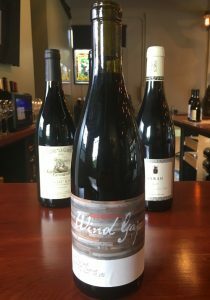 With Pax’s reputation for gorgeous and balanced Syrah, I came to this one with high expectations, and I was not left wanting. At only 13.2% natural alcohol, this is really lovely stuff, vivid to the core and a wine that has years of life left, drink over the next 3 to 5 years or longer.